The PocketWizard Plus II transceiver system does more than cut the cord. 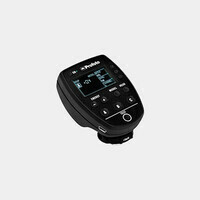 The PocketWizard Plus II can wirelessly trigger lights and/or cameras within a range of 1600 feet of the transceiver. Utilizing advanced wireless technologies, four 16-bit, digitally-coded channels are available for selective firing of lights, or when working in crowded environments. If speed is a concern, images can be captured at a rate of up to 12 frames-per-second. Ultra-fast microprocessors allow for top sync speeds of 1/250th-second for focal-plane shutters and 1/500th for leaf shutters. The PocketWizard Plus II is compact, with a short, unobtrusive, rubberized antenna. The total height of the transceiver and antenna is about 6oz including the batteries. To ensure a secure fit to your camera or bracket, the Plus II features sturdy locking rings for hot shoes.